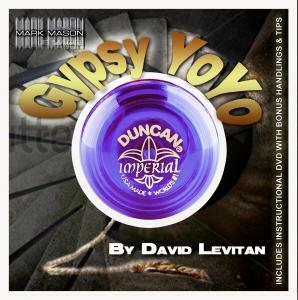 What do you get when a Duncan Yo-Yo meets the classic Gypsy Thread? The Gypsy Yo-Yo, of course! If you do kid shows, comedy magic, close-up, emcee work, or a platform act, here's an organic prop that will resonate with any audience. Invented by professional magician David Levitan, and audience tested by him for more than a year, he's tweaked and retweaked everything, from the thickness of the thread, to the secret of where the gimmick is hidden. It's all been worked out. Here's the effect: You show a real Duncan Imperial Yo-Yo. After making it go up and down several times, you explain to your audience that, as a kid, the string was always far too long and the yo-yo would always hit the ground. Trying to adjust the length, you break off a small piece. This is repeated several times until the yo-yo is dangling from a string just a few inches long. The pieces are rolled into a ball and added to the dangling string. Then, in the tradition of the classic Gypsy Thread, the very end of the string is slowly pulled. Your audience will oooh and ahhhh as the ball unravels, magically restoring the yo-yo string. Of course, if you wish, you can wind the string around the yo-yo and once again make it rise and fall, up and down. The gimmick is custom-built inside a real yo-yo. But your audience will never see it, even when you show them a side view of the yo-yo where they are looking between the two discs! At AmazeKids and Vanishing Inc., we were delightfully surprised at the cleverness of the gimmick and simplicity of the method. We think you'll love it too. So many different types of scripts can be created around this effect because the yo-yo has been part of our culture for such a long time and offers the delightful metaphor of life's "ups and downs." We feel it's destined to be a classic for many years. Practical. Visual. Organic. Get Gypsy Yo-Yo and get your Yo on today! Resets in less than 30 seconds. One of the best investments I have made for my show in YEARS. If you are looking for a piece of magic that is recognizable as an every-day object, almost everyone in the room has used, can do an AMAZING trick, and is SIMPLE to use... You have found the winner. I used to do another version of the gypsy thread that would require a balloon, and a tank of helium, and I would have to find a way/place to tether that to the stage.... Praying that it wouldn't accidentally release and fly to the top of the theater. The Gypsy Yo-Yo provided me with all the moments of the other version, without any fear of failure. It's compact, fool-proof, and one heck of a strong magic piece.